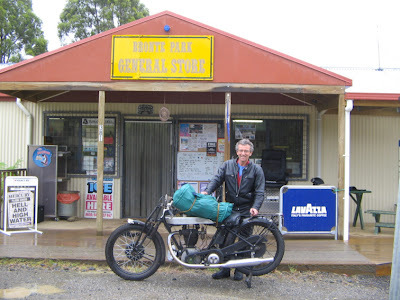 Vintage Norton Motorcycles: Round Tasmania on a 1926 Model 18 Norton. Round Tasmania on a 1926 Model 18 Norton. In January 2011 some mates and I rode around Tasmania. 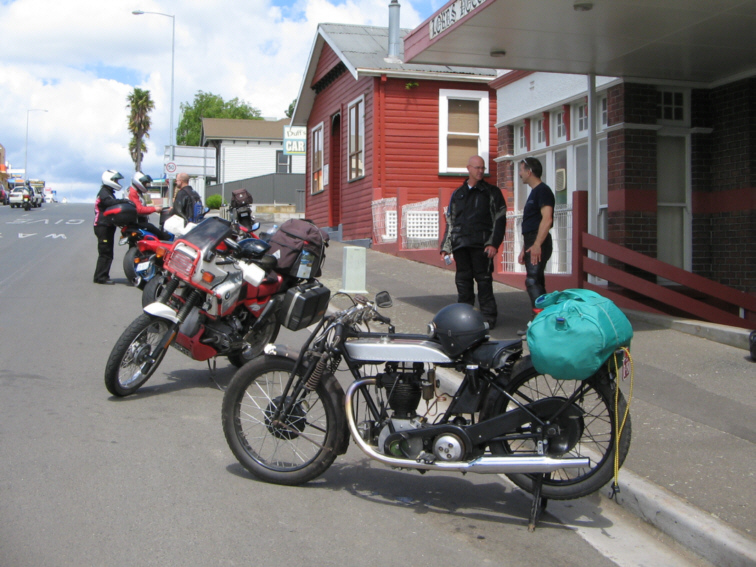 They all had moderns, BMW, Ducati, Honda, Kawasaki, etc, and only my mate Andre on the Ducati had seen my bike before we rode off the “Spirit of Tasmania” in Devonport. 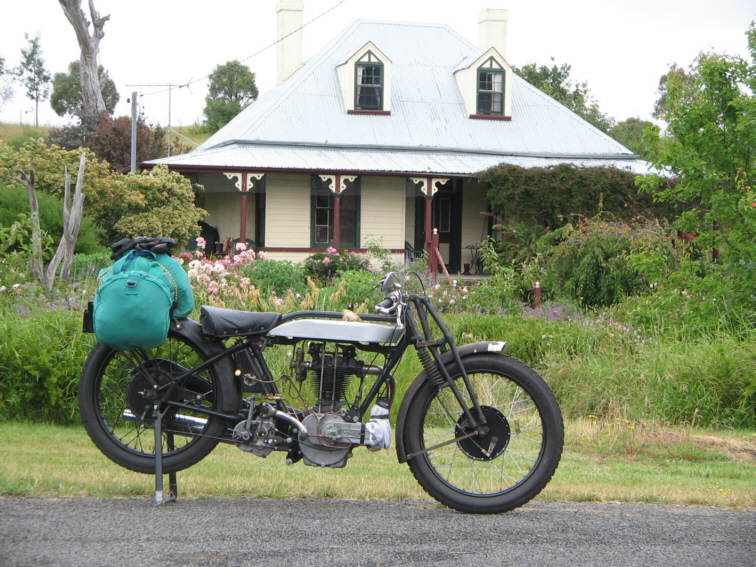 It’s a circa 1926 OHV Norton, made from bits I scrounged, so no pedigree and many incorrect bits. The other riders said they’d never seen anything like it and obviously didn’t think I’d get far, as they all cheered when I arrived at the first breakfast stop. From there we broke into a pattern of me taking off first, riding direct to the evening stop, while they went off in all directions to view the sites. So I spent most of the next four days riding alone. 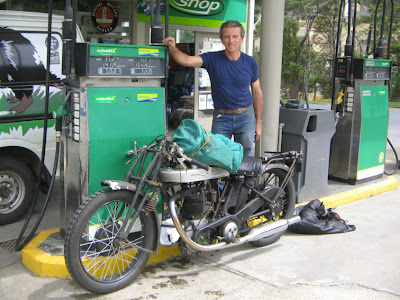 I had a few problems that went with vintage motorcycling, including a motorbike that will start first kick when cold, but is a devil to start when hot. So after the first breakfast stop, my ritual of sweating, flooding, kicking back, swearing and roll starting began for the week. From Devonport we headed toward Launceston, then east toward Scottsdale. Clear day, tight mountain passes interspersed with pastoral valleys, long sweeping and twisting roads down through the valley and back up into the mountains. I kept at about 95 kph on the undulating valleys, and on the many mountain passes kept working the levers to get the best results. I usually got up the steep hills in top gear, but sometimes had to change back to second and hold it in gear with my foot as she jumps out of second gear. The last few kilometres into Scottsdale I rode with my right leg straight forward as it had cramped from holding the bike in second gear. Steak sandwich and a quick beer in Scottsdale and I headed off towards St Helens at the front of the pack. The large green bag is my new ‘travelling sausage bag’, a traditional but almost useless way of carrying my gear. 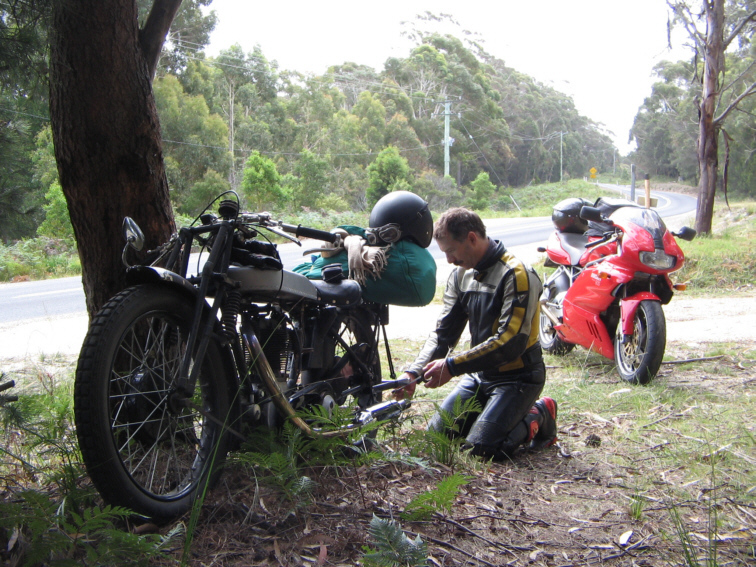 Gear includes the usual spares, spanners, tent and sleeping bag in case she broke down on the long lonely stretches. Out of Scottsdale, another 90 km of the same sweeping and twisting roads to St Helens on the east coast. As I left St Helens I looked down and noticed that my rear stand had broken in two, and one side was flapping around. At the top of the next hill I found am obliging tree by the road and stopped to tape it up before it all flew apart completely. My mate Andre arrived to help with repairs and I was soon pushing off for St Mary’s, our evening stop. Repairing the rear stand with Duck tape. I was reminding Andre that this was the sort of fun we used to have with Norton Commandos, and when was he going to buy an old bike so he could have fun too. He said he’d stick to his Ducati 900 SS for some fun. We stopped at the beautiful 100 year old St Mary’s pub for the night where there was a rusted old 1933 sidevalve BSA hanging in a fishing net on the wall of the bar. It had been discovered in a barn in 1955, and unmolested since. I ignored the suggestions that this fishing net would be a suitable place to retire my bike, and after covering 300 kilometres for the day, was tired but satisfied. The next day we awoke to a glum day of low cloud and imminent rain, and departed St Mary’s in full wet weather gear and magneto wrapped in a plastic bag. Fortunately the rain kept mostly away. Once again, I was left to my own devices amongst speculation as to whether I’d reach the evening destination at National Park (although my friends were quite prepared for a rescue mission, or to ferry cold beers and fish and chips to my breakdown camp if necessary). 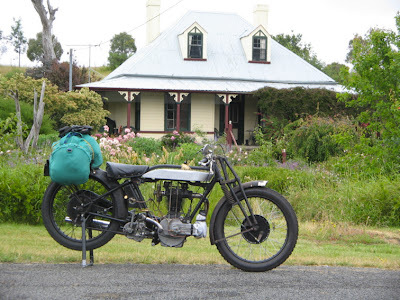 I had a leisurely day travelling though the midlands of Tasmania, marvelling at the beautiful old towns and buildings. In Australia houses and hotels built in the 1840’s are a rare thing, but the Tasmanian midlands have many. I managed to photograph the Norton at a few old buildings near the tops of hills, but most of the oldest buildings were near streams and I didn’t want to turn the Norton off at the bottom of a hill. Just north of Oaklands is St Peters Pass, a slight uphill grade of about 5 km. I tucked in behind a semi trailer and his slipstream pulled me up and over at 110 kph, with the Norton just burbling along. I was surprised to find that you don’t have to be very close to get the slipstream effect. From New Norfolk I took the back roads to Mt Field, wonderful twisting roads alongside the meandering river, bordered by countless hedges and historic buildings, even an old waterwheel at Bushy Park. 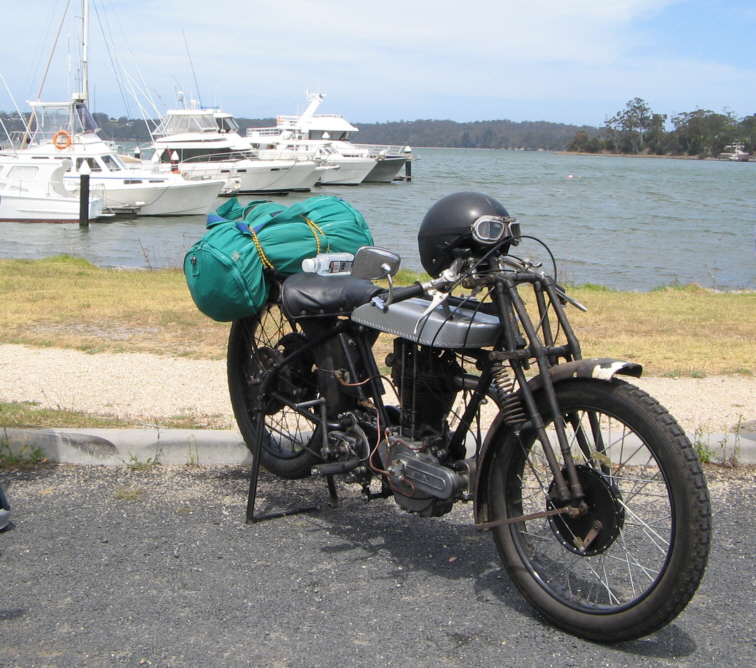 The Norton was on song, covering 210 kilometres for the day. I pulled into the National Park hotel at 3.30 pm in the rain, and was satisfied. Day three was to be the lonely road to Queenstown. I confess that I approached south west Tasmania with some trepidation. I had memories of long lonely stretches, tight twisting descents into dark wet gorges, log trucks, and drizzling rain. And so it was. 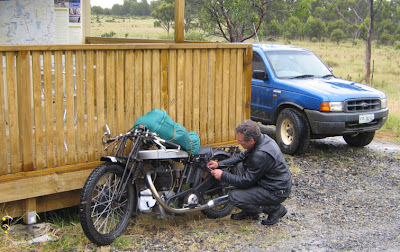 After tightening loose oil lines and adjusting my tappets once again, I left National Park in the rain, heading west. Delightful roads despite the rain. I wasn’t sure how many kilometres I could travel on one tank of fuel, but reckoned about 160 km. So I would need to refuel. Not long on the road, I passed through the first town without stopping, expecting to buy fuel further along. But towns were few. As I neared the halfway point, at Tarraleah, I decided to pull in for fuel, but alas none was available. The nagging doubt began that no fuel would be available until Queenstown, and I would be stranded, fuelless by my own stupidity. About 30 km further along, a sign pointed down a bumpy windy road to Bronte Park, 8 km. I thought that I’d best try it, although it didn’t look promising. Bronte Park didn’t appear much more than a few holiday houses, but my luck was in, the small general store sold fuel. As I pulled up to the pump, I found that the rear stand duck tape had failed, and I had to lean my bike up against the fence to make repairs. Further problems then revealed themselves. The rear mudguard, complete with bicycle pack rack and travelling sausage bag was hanging limp by a thin sliver of metal. This guard is not original, but had been installed many years ago when the bike was set up for racing. I had left it on the bike, because I liked the patina. But it wasn’t made for a travelling sausage bag. After some head scratching I transferred the sausage bag to the tank, strapped up the guard with some cable ties bought at the general store, fired the Norton into life, and pointed her into the open road. Bronte Park. A few repairs, a tank of fuel, and ready for the road again. It’s hard to describe the feeling of travelling alone on an 84 year old motorbike in such a place. I can say that the trepidation, the rain, the beautiful, lonely and sometimes eerie scenery, the wonderful twisting roads, and the steady beat of the Norton heightened the senses to a keen edge. I wouldn’t have been anywhere else. The sausage bag pressed hard up against the handlebars provided some awkward steering, but I arrived in Queenstown in mid afternoon in the drizzling rain. 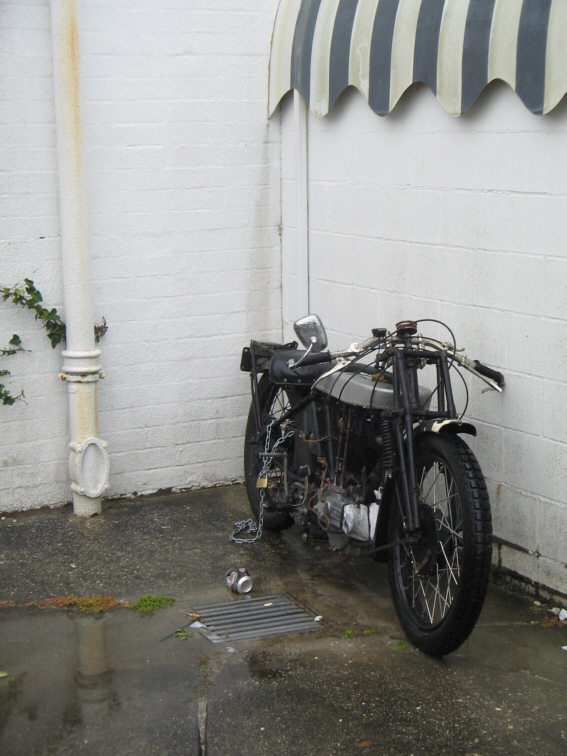 Despite the bits falling off the Norton had covered the days 200 kilometres in good heart. The beautiful and lonely road to Queenstown. 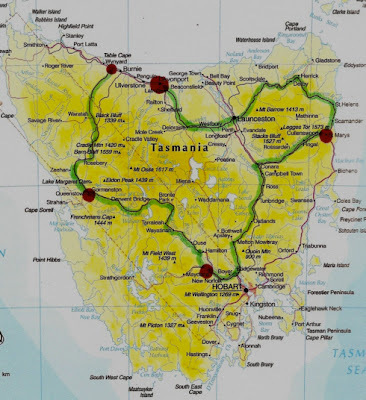 From Queenstown we were to head north, and I determined that I would make for Devonport, to complete the Tasmanian circuit before I headed for the next rendezvous point at Cradle Mountain. The day dawned clear, and we were in high spirits as we all separated for our various destinations. Mine, the direct route. Looking down the mountain pass toward Queenstown. A little blue sky even peeked through as I headed out of Queenstown on the road to Rosebury. I hadn’t travelled 5 kilometres when I heard an awful clattering behind me. I looked back to see the rear stand had collapsed into three pieces, one of them trailing along on the end of some duck tape, and the other bits lying down the road. 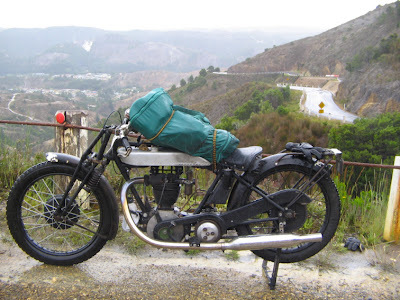 The Norton was not easy to manoeuvre with myself spreadeagled over the travelling sausage bag (which wanted control of the handlebars and the seat as well), but I managed to retrieve the pieces and jam them under some straps without stopping the engine, and head north again. 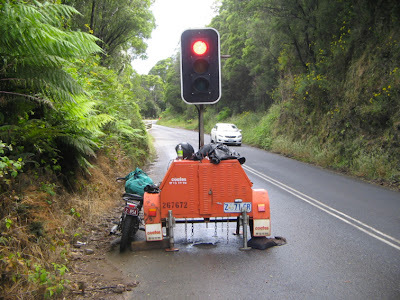 Just south of Rosebury I was confronted by a traffic light at the Ring River, where road works were allegedly taking place. Of course the traffic light was at the bottom of a gorge, I got the red light, and foolishly stalled her trying to find neutral. I figured it was a good time for a break, to repack the rear stand pieces, let the bike cool down, lean her up against the railing to start her, and then take off on the green light. I was well pleased when all went to plan, although I was still having some trouble finding neutral. A little forlorn at the red light. Things starting to go awry. I soon made Rosebury, where the petrol station was at the top of the hill. I now had enough fuel to travel the 140 kilometres to the next town, and it wasn’t raining. All good again, although changing gears was a bit clunky. 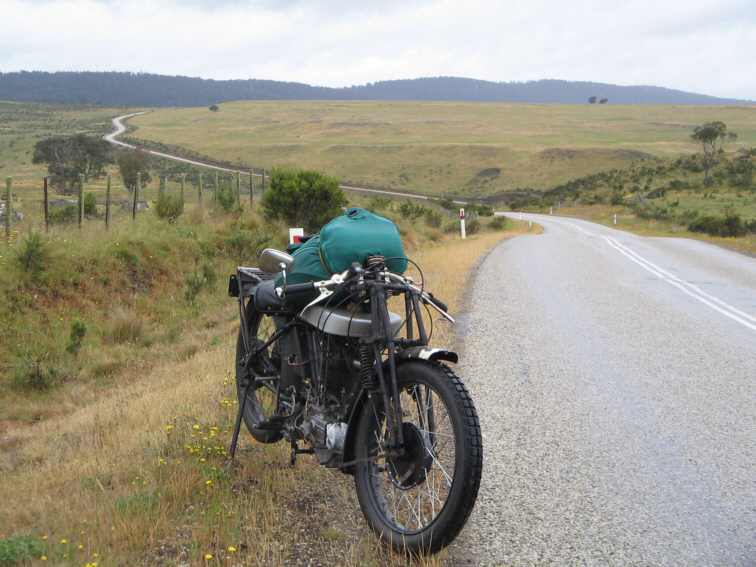 The road to Somerset can only be described like most Tasmanian roads. Beautifully surfaced, long sweeping curves through undulating hills, and twisting sections through mountain ranges and down steep gorges. Tasmania would be a motorcyclists Mecca, if only it didn’t rain. But I was in luck. Although the rain constantly threatened, it mostly held off. After passing through the Hellyer Gorge I found a road sign to lean the bike on while I took a break, and again found some complications. The rear guard had finally sheared off completely, and the cable ties were the only thing holding it from falling on the road. It wasn’t rubbing on the back wheel, and I didn’t want a great wet stripe up my back, so I figured I’d leave it there if it stayed clear of the wheel. As I roll started her down the hill I was having trouble finding gears, but eventually got her into top gear. I kept her in top for the final 50 kilometres into Somerset where I would have to do some serious fettling. The light drizzle was turning into a steady driving rain so I just tucked in behind the big sausage bag, concentrated on the road, and on methodically windscreen wiping my goggles with my left index finger. The Norton just beat on. Finally into Somerset, with water everywhere and rivers rising. As I quietly turned off the highway into the town I dropped her into first gear, at which the back wheel locked, and despite me pulling in the clutch, she stayed locked. I skidded to a halt, and pushed the last couple of hundred metres to the pub. I leaned my bike up against the pub, got a room for the night, had a beer and considered my options. 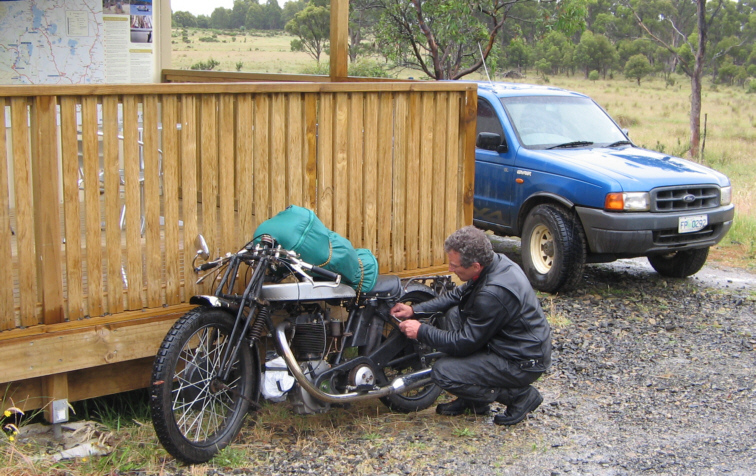 I decided not to strip the gearbox in the rain behind the pub, and after travelling about 900 kilometres in four days, 40 kilometres short of the full circuit, my motorcycle ride around Tasmania was finished. Postscript: Diagnosis of gearbox was a mainshaft seized into the cluster gear. Hence she ran OK in top gear. The problem with cobbling together old parts to make a bike is that they're all somebody elses rejects. My mainshaft was 40 thou bent, and it had a brass sleeve inside the cluster gear to take up old wear. It all became too much for her. So again, Pa Norton isn't to blame.